A must try recipe if you crave the Taco Bell Chicken Quesadilla. A homemade Creamy Jalapeño sauce, grilled chicken strips and cheese, are all stuffed into soft tortillas, replicating the fast foods (Taco Bell) version. If you want to make things even more homemade make your own freezer pre-cooked grilled chicken strips. Break up 3-4 strips of grilled chicken and place on the bottom half of each tortilla. Drizzle 2 teaspoons of creamy jalapeño sauce and sprinkle with 1/2 cup of cheese. Fold tortilla in half and lightly toast on each side in a pre-heated skillet over med-low heat until cheese melts. 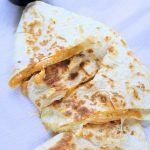 A must try recipe if you crave the Chicken Quesadilla from Taco Bell. A homemade Creamy Jalapeño sauce, grilled chicken strips and cheese are all stuffed into soft tortillas replicating the fast foods (Taco Bell) version.